Raised primarily in Pennsylvania, Alicia Hoffman now lives, writes and teaches in Rochester, New York. 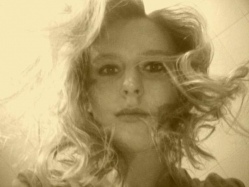 An MFA candidate at the Rainier Writer’s Workshop at Pacific Lutheran University, her poems have been published in journals such as Redactions: Poetry and Poetics, Tar River Poetry, Poets/Artists, Red Wheelbarrow, A-Minor Magazine, SOFTBLOW, elimae, decomP, and elsewhere. She is the author of Like Stardust in the Peat Moss (Aldrich Press, 2013). 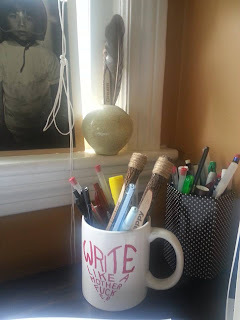 Laura Davis: What color is your writing process? Do explain. Alicia Hoffman: I would say deep ocean blue. When I write I attempt a dive into water. I try to immerse myself in the temperature of the poem. Granted, sometimes I am knocked by the waves of distraction, coughing on the impediment of time or my own imaginary walls that block that ocean of imagination. I hope I don’t sound too cheesy, but when I think of the color of the writing process, I am thinking of diving down through all the gradations of blue. LD: How do you decide that you are finished working on a story, essay, or poem? AH: This is a great question and one I always struggle with. I immediately think of Valery, who said “A poem is never finished, only abandoned”. And I think of what one of my writing mentor’s, David Biespiel, once said, that we are always writing different versions of the same poem. That, in essence, when we discard one, or “finish” one (though they are never, truly, finished), we move onto the next poem or story- unknowingly writing out of the same compulsion that brought us to the first. I think there is truth to this. And I also think there comes a time when I just have to let the poem go. That, maybe, I needed to write that poem, in all its imperfection, in order to move on to one that may reach farther and ring more true. It’s all a process. And I am still learning to accept this process, because it is a difficult thing to learn. That maybe we can’t work on the writing till it’s perfect. That perhaps its imperfection is part of what makes it sing. LD: How long have you been writing? What’s the first thing you remember feeling good about having written? AH: I was reading long before I was writing, and then I was writing long before I was writing anything but angst-ridden journal scribbles. I had it bad. It wasn't till I got to college that I realized people could actually study poetry. And not just study poetry, but study the actual craft of writing poetry. I still don’t know if I've written a poem that I feel forever good about, but I have written some that I feel good about for what they are. It was probably sometime after graduate school – a poem that got published in an actual journal. I felt validated then. There is something about having some stranger enjoy what one says that makes us feel less disconnected to the world. I am constantly second-guessing my own writing. I admit. I usually feel real good about having written something, anything, at first glance. Then, when I wake in the morning and revisit the same poem, it’s a bit more distant, and I begin to scrutinize. I then go deeper into that scrutinizing until I can’t any longer. Sometimes I bury it, deep in those word files, knowing it won’t last, and other times I sense I can’t go further but yet it feels somewhat complete and I send it out into the world. Then, I again begin to massage that impulse that yearns to withstand the test of time. 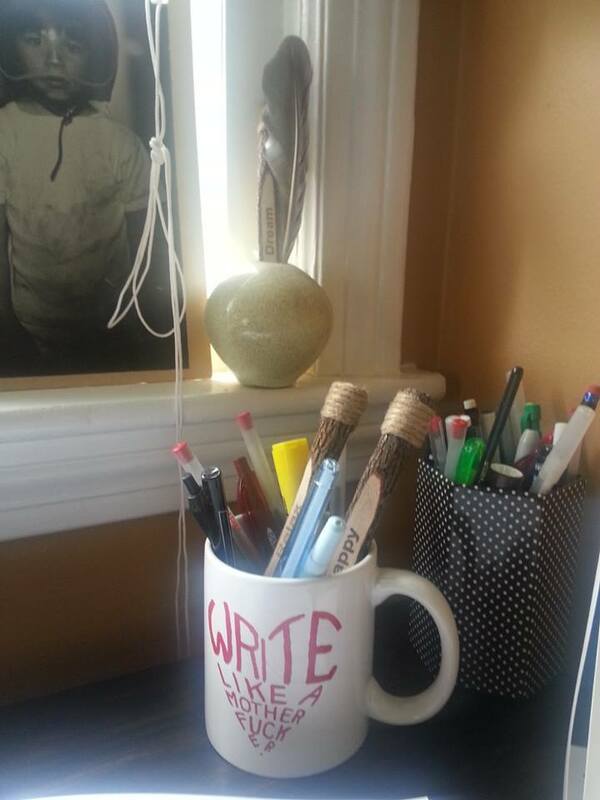 LD: How do you motivate yourself to write? Chocolates? Self-flagellation? Coffee on an IV drip? AH: Wine. But seriously, I think sometimes writing is like an itch that needs to get scratched, a nagging at the back of the brain. For me, it is a compulsion. When I go long spurts without writing, I feel something akin to guilt. It’s a self-inflicted guilt. But it is also, for me, a welling forth of feeling. Physically, I don’t know if I could ever not write. I think I would become a different person. A lesser person. I feel lighter after writing. More buoyant. Better. And if that’s all it brings me, so be it. I write to honor myself and the world.